The issue of mental health in soccer is thrown back into the spotlight as figures released in Norway show that four in 10 of the nation's top players have suffered from depression. 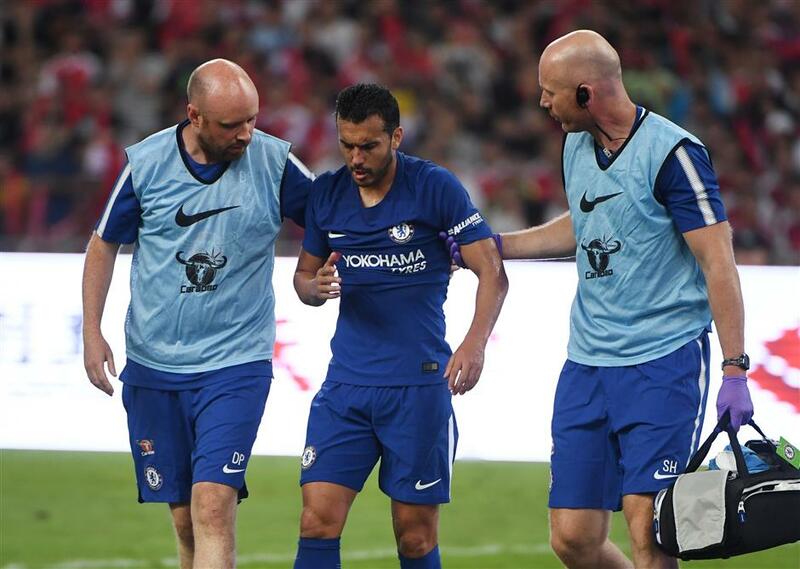 Chelsea's Pedro leaves the field after a collision with Arsenal's David Ospina during their preseason match at Beijing's National Stadium, known as the Bird's Nest, on July 22, 2017. The Spain forward suffered from concussion and has returned to London instead of joining his team on a trip to Singapore for another International Champions Cup match. The issue of mental health in soccer was thrown back into the spotlight this week as figures released in Norway showed that four in 10 of the nation's elite soccer players have suffered from anxiety and depression. NISO, the representative organization for Norway's professional players, took part in a survey in 2015 organized by global players' union FIFPro, and the local results shocked NISO boss Joachim Walltin, who called it "a matter of life and death". "I think we could help turn many of them around if we could talk to them about it, and they could get help at an early stage," Walltin said. A number of high-profile players have spoken out on the subject, including former England international Steven Caulker, of Championship club Queens Park Rangers, who in June described his own struggle with mental illness and addiction. The Norwegian survey results showed that 43.8 percent of respondents said they suffered from anxiety or depression, with almost a quarter having trouble sleeping and close to 7 percent saying they had a problematic relationship with alcohol. The symptoms are familiar to Thorstein Andersen Aase, who turned his back on top-flight football in his early 20s after suffering from a prolonged bout of anxiety about his performances. "It was a time where the faults in my motivation progressed into symptoms that could represent depression and angst, but as soon as I stopped playing they were gone," he said in a telephone interview. "The following day I slept like a baby, and I hadn't slept well for a year and a half." Widely regarded as one of the top young talents in Norwegian football, Aase broke through early at top-flight club Stabaek, but though he felt he was ready technically and tactically, he was not mentally prepared for the step up. "The change to senior football is tough. Making that change at 16, 17, 18, 19 is demanding and you often do so without the clubs having the competence to help," he explained. "My experience is that it all depends on the circumstances; I was always well looked-after socially, but I had other personal needs that weren't taken care of because the club didn't know. They were never examined." The 25-year-old said that clubs must now focus more on the mental well-being of players, rather than solely concentrating on their physical health. "There is a selection hypothesis (in sport) that forms the basis, and that studies have shown to be wrong, namely that if you are selected for your technical and tactical talents, then you automatically have the mental talents, too, and that's not necessarily true." Worried that he would be dropped if he told his coaches about his mental issues, Aase struggled on but he eventually decided to quit Stabaek, dropping down to Norway's third tier to play with friends at the KFUM club in Oslo, and his love for the game returned. Many would be disappointed at having to abandon their dream of becoming a professional player, but not Aase. "I am relieved, because (the life of a soccer professional) doesn't suit me," he explained. "You have to go a long way back to find the crossroads, the point where I looked forward to a long life as a football player. "I have good friends who play abroad and for the national team, and I see that many of them are very happy with life. At the same time, I hear and see many who don't have the same opinion of it when they are pros as they had beforehand." Now studying psychology, Aase said the key to helping the talents of the future lies in looking after the individual's needs, rather than just the team's. "We have to think about building carefully, not just thinking about the technical and the tactical, but also the individual mental talent," he said. "I'm not saying we should let everyone do as they want, but we are a long way from a good middle way where we tailor the environment to individuals, and how we can help them."